Why does my air compressor perform differently at higher altitudes? 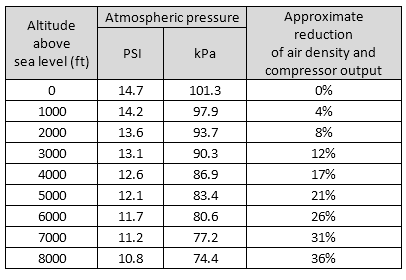 Why does my compressor system perform differently at higher altitudes? Anyone who has had to use a compressor at a high altitude knows how frustrating it can be. 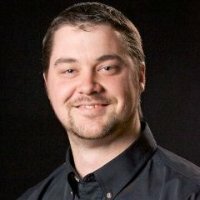 Compressor performance is degraded and it can take a lot longer to complete tasks. People who move to or work in areas that are at a higher altitude are often surprised when their compressor seems to be working slower than normal. Mobile air compressor systems commonly in use typically consist of a gas or diesel engine powering an air compressor. When you turn on an air compressor system, it draws in ambient air through the compressor intake and compresses it to a smaller volume. This compressed air can then be stored in a storage tank or used to directly power your tools and equipment. 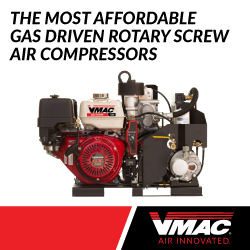 Once the air storage is full or the tools being used are no longer running, the compressor stops drawing in and compressing air by either shutting off the engine and compressor or entering some sort of a standby mode. The air around us is made up of many molecules of different gases, primarily Nitrogen and Oxygen in gaseous form. The amount of molecules in a given volume is referred to as the density and it depends on many factors; one of the most important ones is the gas pressure or atmospheric pressure in this case. As altitude increases the atmospheric pressure decreases. This is commonly noticed during air travel as a popping in your ears after takeoff and before landing. Atmospheric pressure is caused by the weight of all the air molecules above you pressing down and compressing the air around you. At higher altitudes, there is less air above you (and therefore less weight) resulting in a lower atmospheric pressure. How does this affect compressor performance? Another factor to consider is the effect of altitude and air density on the operation of the engine that is powering the compressor. As altitude increases the air density decreases resulting in a roughly proportional decrease in the horsepower your engine is able to produce. A normally aspirated diesel engine might have 10% less power available at 800m/2600ft and 20% at 1600m/5200ft compared to operation at sea level. Different engines will have different de-rate curves depending on the engine design, for example, some turbocharged engines can compensate for the effects of altitude. Reduced engine power can result in a situation where the engine bogs down and the RPM drops which results in fewer compression cycles per minute and therefore less compressed air output. In extreme cases, the engine may not be able to run the compressor at all without stalling. There are a few ways of potentially overcoming the challenges of using your compressor at high elevation. Consult the compressor manufacturer to see what they can offer. Perhaps a simple adjustment of engine RPM to increase the compressor speed will be all that is required. If the compressor is belt driven it may be possible to change pulley diameters to increase the operating speeds of the compressor without changing the engine speed. Some engine manufactures may also have high altitude components or programming to help offset the power decrease. Using a higher output engine and compressor system that has enough power and CFM to meet your needs even with the performance drop might be a viable option as well.